OK, I was doing a GHCN V1 vs GHCN V2 comparison for “practice” while waiting for GHCN V3. And I decided I needed a direct comparison between the two. That meant the dT/dt method could not be used since it ‘starts time’ (and the baseline) in the present. And “the present” ends in 1990 for V1 and in 2010 for V2. What to do. What to do. So I decided to use a ‘large chunk of common data’ for the baseline. The results of that are in “other hands” right now and may become a posting later. But along the way I realized that I had a way to validate dT/dt and/or show the “shape of the data” in a way anyone could do at home. There is a very strong rise out of the Little Ice Age at the start of the thermometer series in 1701. Partly this is due to there being only one thermometer and it was in a cold spot. So I’ve chosen to “start time” in 1800 for this graph. This way it includes the “start of time” for GIStemp (1880) and CRU (1850) along with some context (1800-1850) so we can see if there was any cherry picking going on. It also includes 1816 “the year without a summer” just because I’m interested in it. This one chart says so much. You can click on it to get a larger version with much more detail. OK, I’d like to jump right into analysis, but first a couple of notes on the process. It’s very simple, and yes, you can do this at home. For each thermometer, I average all the data in any given month. That is the “baseline”. It then gets subtracted from each monthly data value to make that value an “anomaly” or “delta from the average”. These “monthly anomalies” are then averaged together for all thermometers that exist in any given year (Those data are the thin “hair” lines in the graph for each month. ), at the same time an annual average is calculated by adding up the anomalies for all thermometers in a given year. You could do this in a spreadsheet. FWIW, this graph fairly closely duplicates the dT/dt graphs, giving more confidence in the validity of both. So What About The Graph? Well, first off, notice that a trend line fit to the annual data is just about dead flat right up until about 1990. (That is the very thin blue line at near the zero line) The change of “duplicate numbers” or “modification history flag” on thermometers starts to hit in about 1986-1987 but those records have a matching entry from the prior “duplicate number” until about 1990 when “the reveal” is done and the older series of “duplicate numbers” are dropped. You could put the segment break at 1987 and get similar results, but I chose 1990 as that is when the data series are left to stand on their own. That is the most striking thing I see. Just look at the slope of that thin Hot Pink trend line! We go from nearly flat trend up to 1990 (the thin blue line) to dramatic warming (thin hot pink line) just as the “modification history” or “duplicate number” change indicates a change of processing of the data. Hmmmm. Now, mathematically speaking, you would expect a broader range of excursions in the early years when there are few thermometers. If you look at the 1800 to 1940 part of the chart, you see both high and low excursions get compressed as the thermometer count rises. Not dramatic, but clearly happening. Then in that 1950 – 1980 part, volatility goes WAY down. It would be very interesting to do a statistical analysis of the degree of compression of range and ask if that is in keeping with the number of thermometer count change, and if not, it implies thermometer selection bias. To my eye, that’s what the chart says, but it needs a rigorous statistical treatment by someone other than me. Is that volatility reduction really justified by the effect of averaging a few more representative thermometers? Though: it is worth noting that the volatility does start to rebound in about 1977 with a cold spike. I remember it “snowing where it doesn’t snow” in a couple of years around then. But I also remember a lot of “110 F in the shade and there ain’t no shade” years around the ’60s and ’70s. This makes that very low volatility, and no hot excursions at all, look very wrong to me. It was 117 F near Marysville one of those years, the hottest in the area ever and not reached again, IIRC. So those clipped hot peaks are very, very suspicious. To me, this is NOT just a result of a few more thermometers. It looks like both MORE thermometers and LESS VOLATILE thermometers. Less volatility happens at warmer places (lower latitudes and elevations) and near the water. The same pattern of thermometer change over time that we’ve seen in the prior analysis of thermometer location changes over time. Our “thermometers on the Beach” problem is showing up in the volatility compression. Then a Very Odd Thing happens. Either CO2 has a 200 year lag in effect, or it’s not CO2 causing the data to change. So take just a moment to look closely at the “hair” in that 1990 to date segment. That the post 1990 range is so non-physical is, in my professional opinion, evidence of data tampering. Perhaps deliberate, perhaps out of error. But the data are now very non-physical. It has clear onset in time. That time matches a recognized change in the processing at NOAA / NCDC (when many / most stations increment the “Duplicate Number”) and match a date when new “Quality Control” procedures were introduced for the USHCN data set that will preferentially suppress cold going anomalies in that data set. Could something similar have happened to GHCN? Further, 2009 had many cold locations, much snow around the world (it snowed on the French Mediterranean coast…) and was NOT a warm year. Yet the “Hair” for 2009 does not even make it down to the zero normal line. To me, that says these data are cooked. Not enough for a conviction (yet…), but enough to justify a detailed Forensic Investigation. And yes boys and girls, you can try this at home. I realized that the first graph does not have the legend on it. Here is a version with the legend. You really do need to click on this graph and get a bigger copy to see the equations and see the detail of the lines. I’ve added fat trend lines to each of the monthly “hair” plots. The equations are at the bottom of the graph in “month order”. So if I’ve kept all this straight, you ought to be able to pick out, for example, the August lime green line and the 8th equation in the list and see that August has not warmed. At all. The other summer months are not much warmed either. The “warming trend” is all concentrated in the winter months. I find it very interesting that the “hair” plunges below their collective trend lines rather dramatically around 1970 and collective jumps way above the trend lines in the last decade. Very unusual when compared to prior years. Just wrong for a natural process, IMHO. And yes, I know that the data series has far more N.H. thermometers than southern hemisphere and that without areal weighting they will dominate the trend lines. To me, that says these data are cooked. Lets take that as a given for the sake of argument ie. each year they fiddle with the data to get the required result. They switch in some “hot” stations for 1950 to 1970 to reduce the temperature drop leading up to the 1970s iceage scare… this is a NET effect hidden in the bubble of new stations. Now look at the station drop outs from 2007… this is hiding the decline… big time… at this rate there will be no stations left in a few years…. So where are we… that is not easy to say because the books are cooked… but my guess: the 1930s and 1940s were the century maximum… the long term trend since 1950 is downward… we had a slight reprieve with Solar Cycle 23… but we are now back on track… into the decline. Another Nice one MR Smith, but of course “they” feel completely justified in Mangling, oops I mean “improving” the data based on their superior knowledge. The first law of a salesman says: “Do not ever mention your competition”. We all know, much more after “Climate Gate”, that all this was a scam. There is no need to mention it anymore. Just a non-scientific, and probably “who cares” type observation: The increase in “official” temperature measuring sites across the U.S., really started a bit prior to the 1930’s, and can be attributed primarily to the rise of aviation, airmail, and airfields. Then, WWII brought even more rapid expansion of military airfields in the U.S., especially in the south, and we had even more “weather observations” available. After WWII commercial aviation similarly fueled the expansion of aviation weather sites. To repeat what you have done, I need to access the same data. Links please. @Mike Jonas: I used the GHCN data from NASA. Links are under the GIStemp tab up top, but I’ll dig around a bit and put a copy of the link here. I used the Feb 2010 copy, but the present copy ought not to be too much different up to 2009. You want the “v2.mean” file. It’s actually an important observation. Most airports have transitioned from a grass field to acres of tarmac and jet exhaust over the last 75 years. That many of the thermometer stations were located there (and a very high percentage of those that survive to date…) is a fundamental warming bias via station selection in GHCN. Thx. I have downloaded the data and can read it ok.
No promises as to when I can complete the task. FWIW, under the dT/dt category on the right side of the page, you will find a bunch of examples of where I used a slightly different technique but applied it “by country”. You tend to get very similar graphs. So you could start by just picking one country, select out the records with that “country code” (the first 3 digits), and start with them. That gets it down to a couple of dozen thermometers for some countries, but still yields an interesting answer. Is it possible that what you have done is remove all traces of the “natural” warming in the last 200 years, and left only the AGW component? The trend in pink could easily be pulled back to start in the late 60s, and be consistent with AGW. Not that I believe in AGW, but your work looks to me as if it is saying that the post-1980s data IS showing AGW. Of course, it could be (as I think) AGW caused by data selection, delection and “corrections”. Still, if you believe in the data (an IPCC hanging point), then I’d suggest you just gave the warmists a good speaking point …. Please do not treat the above document as gospel yet, because I haven’t double-checked all my workings – but the results do appear to be very significant. I would be keen to have someone go over the method I used, but I would prefer to supply the details “off-line” at this stage. If you can email me, I’ll reply with the details. @Mike Jonas. Very interesting, and also being an Excel user I’m keen to know how too! Presumably that last one should be an avg not a sum?? I haven’t done the arithmetic, but I don’t see how this can ever trend away from zero over a period of years. PS. I am currently trying to find out whether my findings on selection bias could get published in a p-r journal. Actually, no. That would ignore the COOLING into the ’70s. We were not warming for almost the entirety of the industrial revolution. There is a clear rise out of a known abnormally cold period (the Little Ice Age) then flat for a lot of the industrial revolution later years, with a DROP during the most rapid growth into the early 80’s. Not consistent with AGW at all. Any this process does not remove any data nor any trend, so I’m not ‘removing’ anything natural. Then the most telling thing about the graph, but what most folks seem to ignore, is the “Hair” part. Those monthly excursions. Suddenly we have a ‘clipping’ of the low going excursions of a type never seen anywhere in the record before starting right when a change of data processing happens with the change of mod-flag (duplicate number). So we have an overall rise similar to what has happened before, but with a “hair” profile that is just crazy. That compression of range is just bizarre, especially as the number of stations drops. For each thermometer, I average all the data in any given month. That is the “baseline”. It then gets subtracted from each monthly data value to make that value an “anomaly” or “delta from the average”. Foreach STATIONnumber, Foreach Month, SUM (all data values). Divide Sum(all data values of S-M)/count of (S-M) data items. OK, now we pass through all the v2.Mean data again, and subtract the average from each data item (for any given station-month). If L.A. 1920 December were 22 and the average of all L.A. Decembers were 19.5, the result would be 2.5 as 1920 Dec is 2.5 degrees above the average of all L.A. Decembers. These “monthly anomalies” are then averaged together for all thermometers that exist in any given year (Those data are the thin “hair” lines in the graph for each month. 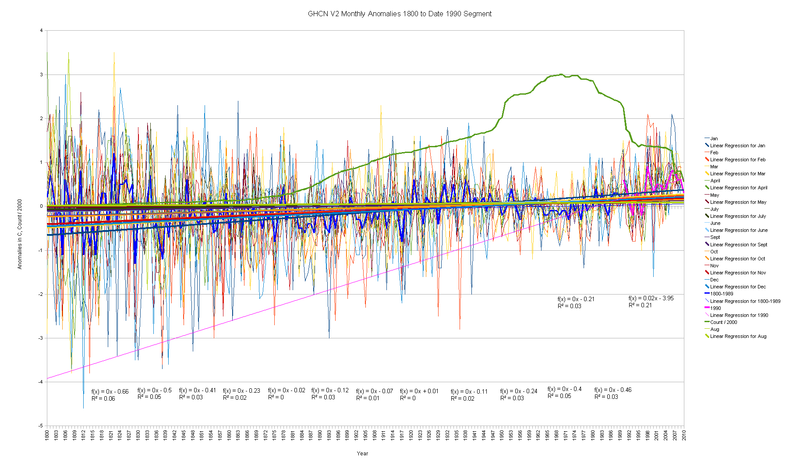 ), at the same time an annual average is calculated by adding up the anomalies for all thermometers in a given year. You could do this in a spreadsheet. So we take this set of “anomalies” and we sum all of them in EACH month in any given year. SUM for EACH YEAR (all anomalies of JAN as JANANOM, All anomalies of FEB as FEBANOM, all anomalies of MAR as MARCHANOM, etc.) and print that as the 12 points of the “Hair” lines for THAT year in the above chart. Average those 12 points to get the annual average anomaly (the thick blue line early one, the pink line at the end). OK, I’ll see if I can decode your version and match it. I think you are using #n for “month” here and saying Baseline(of month #n) = ave(all readings in month #n) for A STATION “s” in that month. I think that is what I’ve said. Then calculate an anomaly of the data for the station “#s” in that month “#n” as the reading in that month minus the baseline calculated for that month. I’d only add that this is done BY YEAR, so you get a data point of anomaly for each station, for each year, for each month. The same total data size as the original data in v2.mean, but with each temperature replaced by an “anomaly” made from subtracting the average of all (station:month) items from THAT PARTICULAR (station:year:month) item. I’m not sure how to read that last part. Going into this part, you ought to have a table with the same number of entries as v2.mean, and all you do is average the anomalies by year by month. That would give a table of years with 12 entries of one for each month that are the average of all station anomalies in that month in that year. (In fact, I make that table. From it, I make the graph). And the 12 entries in any one year can be averaged to make the year anomaly. Thx for the info. Will hopefully have time to work through it early next week. When GHCN version 3 becomes available, expected in late 2010, we will make results of our analysis available on our web site for both versions 2 and 3 for a period that is at least long enough to assess the effect of differences between the two versions. I’ve just gone through the Hansen 2010 pre-print mentioned. Though there is mention of using satellite data for ocean temperatures, I don’t see the UAH or RSS tags. Nor is it used over the land, or over the poles. Is there a serious disagreement between these datasets that Hansen doesn’t even want to let us know they know, or is the UAH/RSS data referenced differently? If this is the pre-print, this is what the warmist will trumpet as the answer to every skeptics complaint, i.e. that they checked and every adjustment and anomaly is correct and real. Is this the paper to have a Watts et al counterpaper? To come out at the same time and go to all the newspapers at the same time as NASA officially releases their new, compelling work at a press conference and pre-Hansen-knighthood ceremony? GISS does not have any actual readings in the gray shaded areas, and those areas are actually larger then shown because you can only turn down the amount of infilling from 1200km to 250 km. As to disagreement between Gistemp and UAH and/or RSS the answer is yes, matter of fact Gistemp is the outlier among all five datasets: HadCrut3, NCDC, RSS, UAH and GISS. This is due to their Polar interpolation. With that being said Gistmep’s biggest divergence is with the satellite record and it’s been growing bigger every year. The usage of Sats in GIStemp is minimal at best. It’s sort of a seasoning in the ‘optimal interpolation’ of all the other ocean surface temperatures that all get combined into a SST mush that then gets sort of grafted onto the land temps. Global warming is expected to have a primary effect of reducing the cold. More effect in winter, at night, and in higher latitudes. It is the daily low temperatures that are rising more than the daily max. @MikeN: Great news! Then there is no “tipping point” as we already have handled the highs just fine. And less cold means more crops growing faster, fewer deaths (as deaths from cold far outweigh those from heat), less fuel needed, more food and generally better wealth and well being for all. Of course, since “Global Warming” predicts everything, it actually predicts nothing. And you will also need to explain how it has this magical effect with a step function onset in 1989-1992 and with differential warming of the cold months in different places (each country has different months warming and cooling, often the SAME month warming in one country and cooling in the one right next to it…) And a few other odd artifacts, but I’m sure it will be No Problem for the “Global Warming Theory Of Everything” to be expanded to cover those annoyances.